Towards the middle of October, my family and I started to flesh out our plans for Thanksgiving. With my sister and I attending college in Boca Raton, Florida, and the rest of our family living in New Jersey, it meant we had to start searching for airfare to get home for the much-anticipated break from college homework, and a delicious turkey dinner. After a few minutes searching the different options out of the South Florida airports, we discovered a very cheap Frontier Airlines flight from West Palm Beach to Philadelphia for only $29, not including a $13 seat assignment fee because I always need to have a window seat. We also booked a ticket for my mom, as she’d flown down to see me complete my first solo flight a few days prior, as well as my girlfriend who decided to spend the holiday with us. After booking our outbound leg, it was time to book our return. 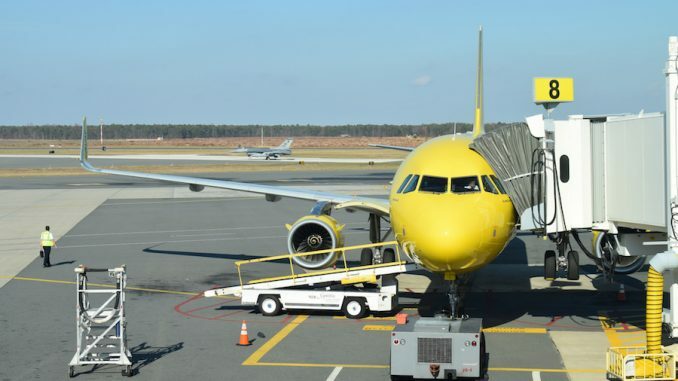 Within minutes, we found an affordable flight with Spirit Airlines from Atlantic City back to West Palm Beach for only $42 a person, not including an extra $16 for the reserved seat fee, which we booked right away. 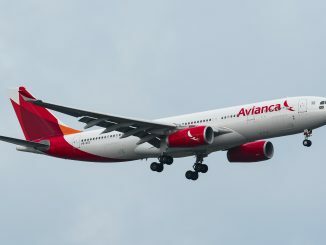 Both flights would be on the airlines’ Airbus A321 aircraft, some of the newest in the fleet. I was very excited for these flights. 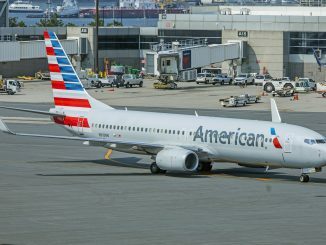 Not only would I get to fly through PBI twice, as I’d only ever used the airport twice prior, but I also had the chance to compare and contrast the A321s of two of the largest ultra-low-cost carriers (ULCC) in the United States. 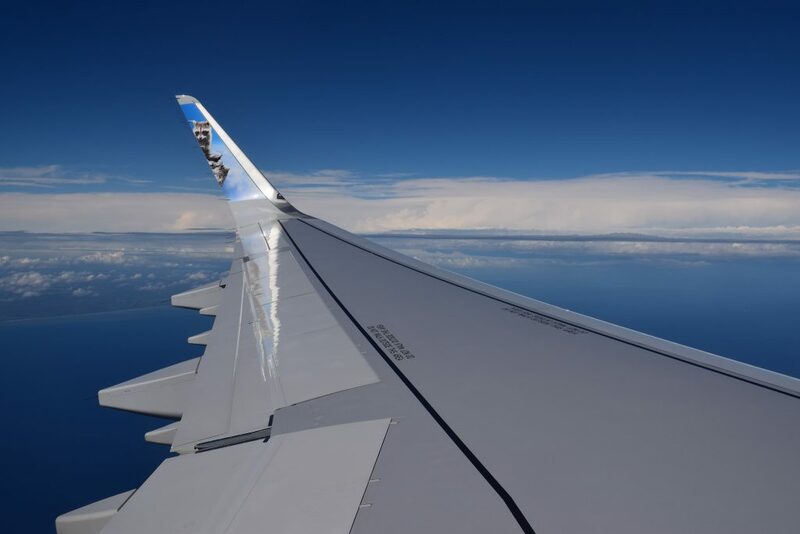 The first flight of the trip was Frontier Airlines flight 1002 from West Palm Beach to Philadelphia on aircraft N720FR, an Airbus A321 with Sharklets. I was particularly eager for this flight as it would be only my third flight with Frontier and on my third aircraft variant with them after flying the A320 and A320neo. 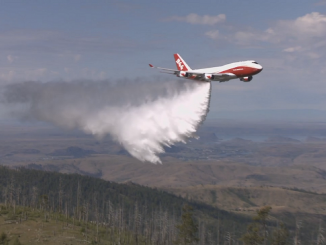 As a semi-seasoned Frontier traveler, I knew what to expect from the airline; one personal item, tight legroom, no-frills service and no entertainment. 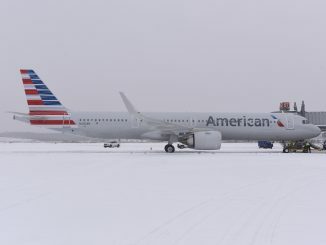 Nevertheless, I was excited about this flight as I am a big A321 fan. Our Uber dropped us off at West Palm Beach’s Terminal C at 9:15 a.m., two hours ahead of our scheduled departure time. We proceeded directly to a line-free TSA checkpoint with our mobile boarding passes in-hand and were through security in less than five minutes. West Palm’s terminals have a different style compared to its South Florida counterparts FLL and MIA. They don’t feel rushed or cramped, but rather upscale with premium-looking seats in the boarding areas, charging ports and free Wi-Fi. I walked around the terminal, which Frontier shares with Delta, JetBlue, and Spirit, and saw our inbound aircraft arrive from PHL at 10:05 a.m. Shortly after our aircraft arrived from Philly, boarding was announced by an energetic gate agent. Being in zone four, we remained seated for a few minutes more until they called our zone to board aircraft N720FR, a brand new A321, delivered to Frontier Airlines only a few weeks prior in October 2017. I made my way to my assigned seat of 22A, right over the wing. I paid $13 for this seat, as it was the cheapest seat available, as well as the seat closest to the front of the airplane. It didn’t make sense to pay $13 for a seat towards the rear when I can get a seat for the same price towards the front. The first thing I noticed about the seat, unsurprisingly, was the legroom. Surprisingly, however, the legroom felt very spacious and not cramped even the slightest. As a 6 foot, 3-inch-tall man, I felt very comfortable in the seat, which also is slightly wider. Soon after taking my seat, the rest of the cabin filled up and the cheery cabin crew welcomed us aboard Crockett the Raccoon, announcing our flight time to Philly as 2 hours and 30 minutes and proceeded with the safety demonstration. We pushed back from gate C9 at 11:10 a.m., about five minutes early, and taxied to runway 10L where we waited for a Gulfstream to depart and then took position on the runway. We roared off the runway and into the clear South Florida skies and east over the Atlantic Ocean. Passing the city of West Palm Beach before turning north and following the coastline, with Jupiter, Stuart, and Port St. Lucie not too far from us. We settled in for the relatively short journey to Philly and I took a gander at the inflight menu. My sister and I decided to purchase the Kids Snack Pack for $3.99 each, which came with Goldfish crackers, Oreos, M&Ms, and a beef stick. 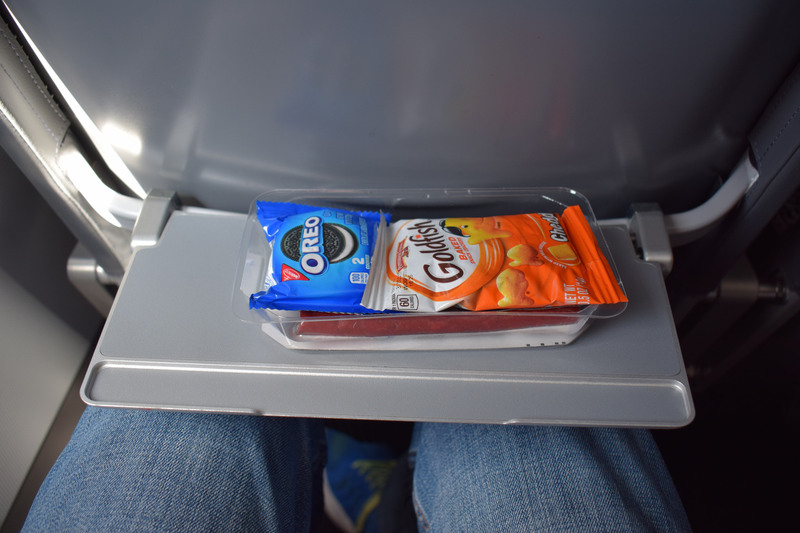 It also includes a collectible Frontier Airlines trading card in each snack pack. Frontier, unlike other ULCCs, offers free water. I enjoyed the flight, passing time by looking out the window and playing games on my iPad. 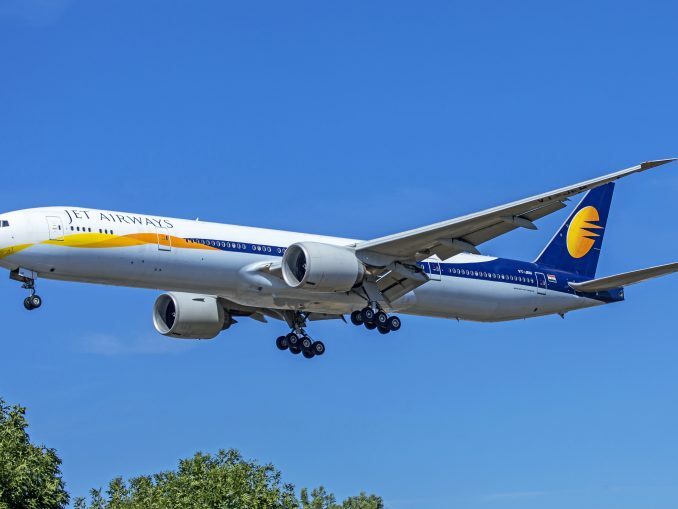 The time certainly flew by, as we began our descent into Philadelphia at around 12:45 p.m. We touched down on PHL’s runway 27L at 1:30 p.m., and pulled into gate E10 about seven minutes later at 1:37 p.m., 18 minutes early. We deplaned and made our way to the departures level roadway, where my dad was waiting for us. I will save my conclusion of this flight for the end of the trip report, to better compare both carriers. However, I was very pleasantly surprised with the level of service I enjoyed on this flight and would love to fly on another Frontier Airlines A321 in the future. The flight home was on Spirit Airlines flight 151 from Atlantic City to West Palm Beach on aircraft N675NK, another Airbus A321 with Sharklets. We spent a wonderful Thanksgiving break in South Jersey. We went to the Philadelphia Thanksgiving Day Parade, had a wonderful dinner with the entire family, and even got to spend a couple days in New York. 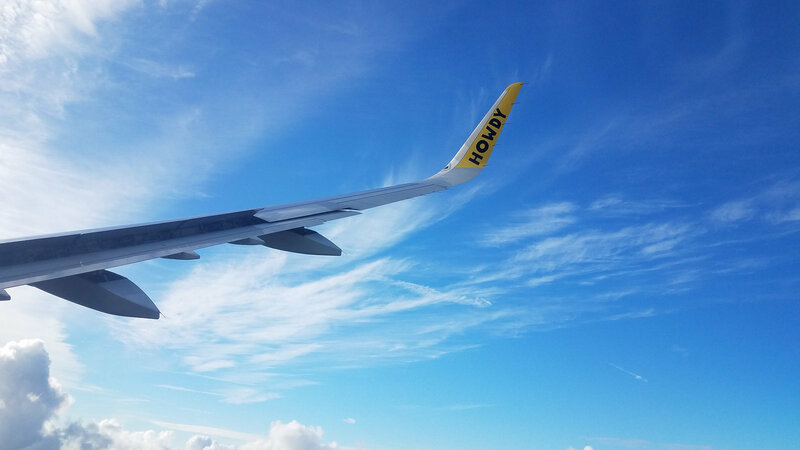 However, all good things come to an end as it was time to get back to studying, and we were doing so in style by flying on another new A321, aircraft N675NK, which was delivered to Spirit Airlines on my birthday this year in May 2017. 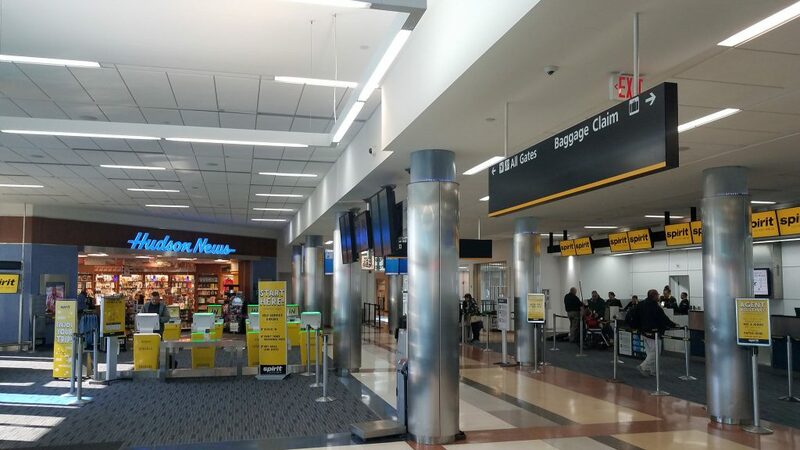 After a nice breakfast at our local diner, we showed up to Atlantic City International Airport at 11:15 a.m., two hours and one minute before our scheduled departure time. Even though we checked in online, I decided to print out a boarding pass from the self-service kiosks inside the small terminal, and we proceeded to security. Luckily, we were given TSA PreCheck to expedite us through the security screening. Unfortunately, we still had to wait for the elderly passengers in line ahead of us to go through screening as there was only one lane open. We were soon airside and made our way to gate eight, which is in the new section of the terminal and part of the 2012 expansion. It was particularly interesting for me to be inside this airport, as I’d previously done several presentations on it for one of my aviation classes. We settled in and waited for our aircraft to arrive from Orlando as flight 132, which arrived at noon. As the ground team was prepping the aircraft for us, I noticed several F-16s from the New Jersey Air National Guard flying over the airfield and then landing. I counted approximately eight aircraft before I boarded my A321. As we waited to board, the area became increasingly congested with fellow passengers going to Palm Beach. Boarding began at 12:45 p.m. and we were in zone 4 again so waited patiently until we were called at 12:55 p.m. We were greeted by another cheery cabin crew as I made my way to seat 33F, which allowed for a better view of the ground, while still allowing me to see the wing. The first thing I noticed when I sat down, of course, was the legroom, and how tight it was. Even though I’ve flown Spirit’s A321s before, it still felt very tight and perhaps even more so after flying on Frontier’s A321. We pushed back at 1:08 p.m., about eight minutes early. The rear section of the aircraft, rows 35-39, was empty, which seemed odd considering the packed boarding area. Our cabin crew welcomed us aboard and we began our taxi to runway 13. Unfortunately, I didn’t get to see any cool fighter jets landing next to us as we taxied. I thought that was a nice touch, since some passengers still may not understand Spirit’s no-frills approach. I opted not to purchase a snack onboard this flight as I thought the prices were unacceptable. I spent most of the flight enjoying the views of the ground below. I also stretched my legs and had fun “pretending to be an aisle passenger” in one of the empty seats towards the back. It’s not as fun as sitting in the window. After an uneventful flight, we made our way down to PBI and landed at 3:25, and arrived at gate C8 at 3:30, about 15 minutes early. After arrival, we disembarked the aircraft and made our way to the designated Uber pickup point at West Palm Beach. I stopped by our outbound gate from a week prior and saw a familiar face, N220FR. That aircraft is one out of the three Frontier aircraft that I’ve flown on, actually, my first ever Frontier aircraft, and was preparing to take passengers up to Islip. After having the opportunity to fly the Airbus A321 with two different ULCCs on the same trip, I can confidently say that the clear winner in this case is Frontier Airlines. 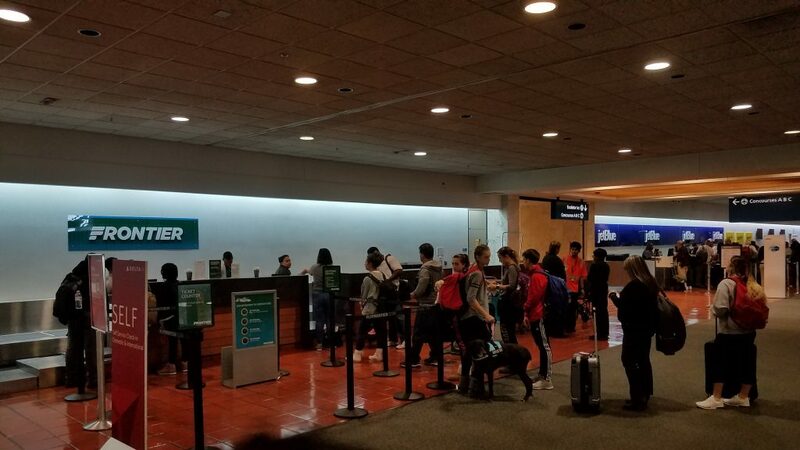 Frontier not only offered a much lower airfare ($29 versus $42), but they also delivered a much cheaper experience overall when factoring in seats and buy-on-board service. Seat selection was cheaper on Frontier, $13 for a seat in the middle of the airplane versus $16 for a seat in the back on Spirit. I found that the $3.99 snack box on Frontier was somewhat filling, and at least I could wash it down with water without having to make another transaction. A comparable snack box on Spirit “Cafe Snack Box,” with pretty much the same food items but costs $7. Then, if you’re thirsty, you need to pay $3 for a beverage if you did not bring your own. When it’s all said and done, you could be spending $6 more on Spirit for a comparable snack and drink, water, on Frontier. The legroom is perhaps the most surprising aspect of this experience. I went into this trip expecting the same tight legroom as I’m used to on Spirit. When I realized I had a lot more room than I was used to, I was shocked. Only after the flight did I look up their seat map and notice they offer 30 inches of legroom on their A321, whereas Spirit offers 28 inches in the airline’s standard, non-extra legroom seats. 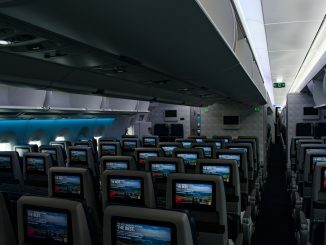 Frontier also manages to pack an extra two rows in their A321s than Spirit, even though they offer more legroom, perhaps due to the new Space-Flex lavatories by Airbus. Frontier’s 30 inches of pitch is equivalent to the pitch found on some legacy carriers’ aircraft. Frontier’s branding is also much more appealing than Spirit, and it doesn’t just show on their website. I personally think it’s an interesting touch to name each animal differently and to have that sign near the boarding door that lets you know which animal you’re flying with. 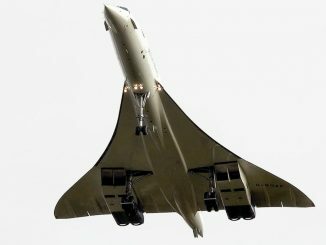 Having the picture of the animal on the inside of the Sharklet is also cool, instead of the word “HOWDY” written in bold letters on Spirit. Finally, I like that they offer trading cards not just in the snack boxes, but for free if you ask a flight attendant, further promoting the Frontier brand. Spirit has a significant advantage over Frontier in other ways, however. 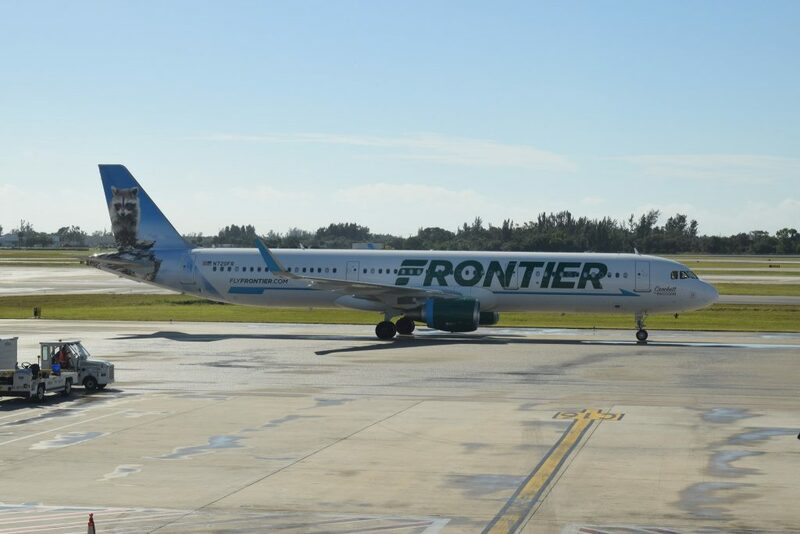 Spirit has more aircraft than Frontier and, therefore, boasts a much larger international network and a larger South Florida presence, which is very convenient for me. 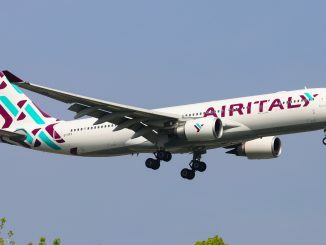 They also offer higher frequency routes from South Florida to the Philadelphia/New Jersey area, as well as New York City, giving cost-sensitive travelers more options than Frontier. In conclusion, I was impressed with Frontier’s A321, which offers more legroom than Spirit’s A321 as well as a slightly higher level of service with a more affordable buy-on-board menu, seat selection fee, and airfare, on this trip. Spirit will give you the average no-frills service on their aircraft, which isn’t bad at all, and much cheaper than the legacy carriers in most cases. If I’m ever faced with the choice of flying Frontier or Spirit, I would definitely choose Frontier. Perhaps if they bolster their route network and fit my needs a bit better, I may need to switch my $9 Fare Club for Frontier’s Discount Den.